Happy Valentine's Day, everyone! This year, Pumpkin was supposed to write her own valentines. She has eleven classmates, plus she wanted to give cards to two of her teachers. We started off strong, completing nine of the valentines over the weekend, most of them in one sitting on Saturday. The last four were quite a trial, though. Pumpkin wanted them to be perfect, and would erase anything that didn't meet her standards. There were many rest breaks with her head on the table. I exhausted my patience, and went off to get Petunia to bed. Hubby managed to convince her to finish up, but the experience clearly took quite a bit out of him. After Pumpkin was in bed, he decided to relive the highlight of last year and replay the New Zealand-Australia semi-final from the rugby world cup. The holiday was rescued, though, by how excited Pumpkin was to give us all our valentines this morning. She had made one for Daddy (with my help), written one for Petunia, and dictated one for me (clearly, she'd run out of steam). Petunia was really excited, too, when she saw the little Cinderella card inside her envelope. She kept it next to her all through breakfast. This evening, Pumpkin was most excited by the candy, pencils, and stickers that had come with her valentines at day care. Petunia, though, just wanted to go through her cards, repeating who each one was from. Very cute. I'm not sure if this was worth all the hassle with getting Pumpkin's valentines done, but at least it ended the holiday on a high note. The song from which I lifted the title of my last post was an obscure 80s song- Having It All, by Eighth Wonder. It was on the Absolute Beginners soundtrack, which my sister had- on cassette. For some reason, it has stuck in my head all of these years. I did finally draw another winner for the Jeanne Baret giveaway. I've notified the winner and she's sent her contact details, so I guess that's that. Remember back in November/December when I was trying to wean Petunia and she wasn't cooperating? Well, I gave up, and now she's weaned. OK, technically, she's almost completely weaned. She still sometimes asks to nurse, but when she does she rarely nurses for more than a second or two. I think the last "real" nursing was last Tuesday (Feb. 7), and the last time before that was probably around January 24th. I've decided that she's weaned enough for me, and I'll let her decide when to stop asking to nurse. Unless she's still asking when she's in kindergarten or something- which seems unlikely. I knew that I just needed to chill out on that one and wait, but my god, that was hard to do. Petunia's sleep is also improving. She's sleeping through until 4 or 5 in the morning most nights now. I like it best when she wakes up at about 4, comes padding down the hall, climbs into bed with us, and then snuggles in and sleeps well until we get up at about 6:30. This doesn't happen that often, but I'll also take her sitting up at 5 a.m., screaming for me, and then snuggling and kicking me in her bed until 6:30. It is a vast improvement over the status quo at the end of the year (which saw me spending half of my night getting aggressively snuggled/kicked). My boss is still a bit freaked out over my outburst in that meeting- which is funny, because, really all I did was raise my voice a little bit and then leave the room, and as one of my team members pointed out, he yells more than that in roughly half of the meetings he comes to. He's stopped trying to deflect work from me, so I think things are going back to normal. We'll see how all of this plays out at review time. I suspect that if I can bring my projects in roughly on time, all will be forgotten. If I don't bring in my projects on time, I guess we'll see how much he really blames himself for the situation. But I have every intention of bringing my projects in on time. 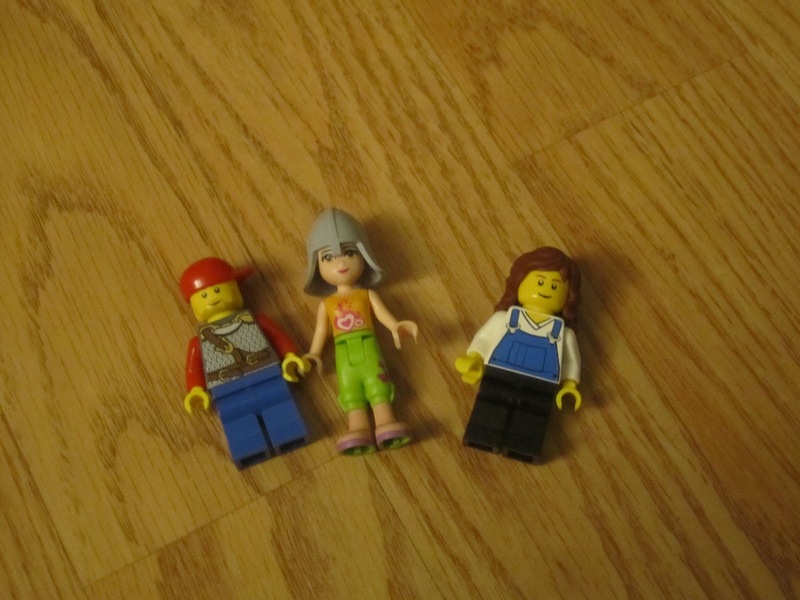 Pumpkin has discovered that the hair on the LEGO Friends figurine comes off, and has swapped hair/hats among Olivia, the dude that came with the house, and the castle guard. So, I continue to feel absolutely no angst about the fact that we bought one of the LEGO Friends sets. We won't hear about our school choice until April or May, but it is still nice to have the choice part done. We were at a birthday party on Sunday, and everyone was talking about schools. It was interesting to hear what other people chose. A lot of Pumpkin's day care classmates will be heading to private school in the fall- but there are a few others who chose public school, including the two sets of parents with whom we get along the best. It will be interesting to see if we manage to stay in touch once the kids go on to kindergarten- we all chose different schools, mostly because we live and work in different areas. Anything else I've left dangling? Ask in the comments. I'm pretty sure my husband considers the Australia vs NZ semifinal a highlight of last year too. And we have a copy of that on the dvr too. Unlike the final - which although NZ won, was ENTIRELY too stressful and perhaps best not thought about in too much detail. We were having a hilarious conversation at dinner the other night with Moo - Dr DK was asking her a series of questions... (All blacks or wallabies, thongs or jandals, black or yellow, kookaburras or kakapo...) and Moo actually did quite well in providing the required response until her Daddy asked "Dan Carter or Quade Cooper" and Moo replied with confidence "Cooper!" DK was quite disgusted, and I was highly amused - especially when I was reading Moo's bedtime story and realised one of the stories she's been reading recently features a teddy bear called "Cooper". So it's ok, she's not actually expressing a preference for annoying Australian rugby players. DC weaned on his own too. Slow and easy. It's funny how the laziest way to do something always works out for us. DC wanted to make his own valentines until we got to the grocery store and saw the wealth of store-bought valentines. (He picked Mr. Happy.) Despite the school instructions saying, "please do not bring candy" he got a box full of candy. And temporary tattoos. At week um... 16? 17? Whichever one is red onion rather than avocado... I'm starting to do the wake every 3 hours when the baby decides its time to play thing (just like hir fetus big brother). I'd forgotten about this. So far I've been forcing myself back to sleep but I really ought to make sure I have work on the computer that can be done. I had reading but didn't want to wake DH with a light. I was super productive last pregnancy... but I was also allowed to sleep in. Maybe I should start taking pick-up instead of drop-off. @Zenmoo, oh wow. Saying Cooper over Carter is pretty bad. There are some Aussie players Kiwis respect... Cooper isn't one of them! @Nicoleandmaggie- oh, I HATED the middle of the night wake ups when pregnant with Petunia. I was so tired from work and taking care of Pumpkin, and it just seemed so unfair that I couldn't just sleep. Your idea of getting something productive done is better that what I did, which was mostly just pout. @Cloud I know! That is what made it so incredibly funny. I still haven't actually told DK about the Cooper/story connection - I should really. Quade Cooper is certainly not one of my favourite players, too reminiscent of Carlos Spencer for my liking. I hope your boss gives you a ginormous raise, because you are awesome. I'm impressed that Pumpkin wrote her own valentines!